SLUMBER PARTY MASSACRE II: Stalk, Slash & Satirize – Schlockmania! It’s safe to say no one was really expecting much from a Slumber Party Massacre sequel. The first film was a bare-bones affair and there seemed to be little to recycle other than the expected stalking and drill-slashing. That said, it would have been impossible to anticipate what writer/director Deborah Brock came up with when she made the unforgettably bizarre Slumber Party Massacre II. In fact, you could say she invented post-modern stalk & slash nearly a decade before Scream hit the multiplexes. The focus of Slumber Party Massacre II is Courtney Bates, the little-sister survivor from the first film. She is a full-fledged teen now and is portrayed by Crystal Bernard, future star of the sitcom Wings. Courtney’s older sis Val is a mental hospital and her mom is consumed with Val’s situation but Courtney takes comfort in the fun she has playing in an all-girl band and the attentions of a boy named Matt (Patrick Lowe). Everything seems to fall into place when Courtney leaves town with her gal-pals to celebrate her birthday at a condo owned by the parents of bandmate Sheila (Juliette Cummins) and Matt promises to make a visit. 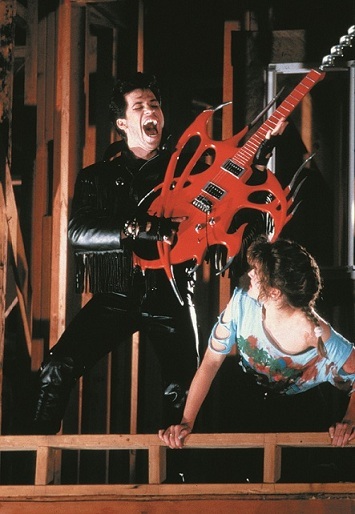 However, there’s a serpent in this late-1980’s Garden of Eden: Courtney suffers from nightmares involving the Driller Killer (Atanas Ilitch), a jive-talking guy who resembles a cross between Elvis and Andrew “Dice” Clay and wields an electric guitar with an electric-drill tip. Courtney’s dreams begin crossing over into her reality, causing her to have bizarre visions in the middle of the day (the most memorable is when she hallucinates that a pesky zit has overtaken a friend’s face, causing it to erupt in a welter of yellow pus). Nobody believes Courtney until the Driller Killer appears in the flesh to drill his way through the cast – and sing a few rockabilly numbers along the way! The end resu lt is a wacked-out delight for horror fans with a sense of the absurd and a nostalgia for the 1980’s. It incorporates several trends of the era – Nightmare On Elm Street-style “dream vs. reality” bits, slask & slash setpieces, the late 1980’s vogue of musicals brought on by Dirty Dancing, horror comedy – and combines them into one thoroughly unpredictable stew. The finale, which merges rock-video style song and dance escapades from the Driller Killer with the expected chasing of the remaining heroines, is unlike anything else you’ll see in a horror film from this time frame. It helps that the film has a surprisingly professional sheen to its tech credits despite the low budget. Thomas Callaway’s cinematography is stylishly lit and full of inventive photographic choices, editor William Flicker’s periodic detours into rock-video montage are handled in a stylish manner and James Cummins provides some memorably offbeat mak eup effects. Brock uses these elements to bring as much style as she can muster to the film and adds a level of kinetic energy that punches this mixture up to a memorable level of frenzy. She also gets above-average perfromances: Bernard really invests herself in her character’s paranoia and emotionalism while Ilitch’s performance as the dream-haunting villain is an over-the-top showstopper. Added entertainment value is provided by the fact that every aspect of Slumber Party Massacre II captures its time period: the music, hairstyles, clothes and set designs instantly take you right back to 1987. The end result may be too eccentric and too uninterested in traditional horror for some viewers – but adventurous schlockophiles will find it to be fascinatingly bizarre and full of surprises. In short, Slumber Party Massacre II lives up to its cult rep and then some. If you can tune in to its crazed mutation of the slasher genre, it’s a blast of fun from bizarro world. I wish Atanas Ilitch had recorded an album in his Driller Killer guise – he could have been the Alice Cooper of rockabilly.